HoLEP, the latest surgical method for treating prostate enlargement, involves threading an endoscope through the urethra to the prostate, and then threading a thin tube known as a laser fiber between the inner and outer glands of the prostate. The enlarged inner gland (adenoma) is then cut out and separated from the outer gland using light from a Holmium: YAG laser. Adenomas enucleated to the bladder are then sliced and extracted by suction, using a separate device. Because the procedure involves minimal pain or bleeding, only a short hospital stay is required. Currently, total prostatectomy is done by means of either abdominal surgery or laparoscopic surgery. The da Vinci robot for surgical assistance combines the best of both. Now, total prostatectomies can be done less invasively, more reliably, and with higher-level performance, minimizing post-surgical problems such as incontinence and erectile dysfunction. Strokes, which are caused by blood vessel blockages in the brain, have traditional ly been treated primarily with drugs used to dissolve the blood clot, a method that had certain limitations. Using the new MERCI technology, a narrow (0.5-3.0 mm) tube, or catheter, is inserted into the blood vessel, and the tightly coiled tip of the catheter is used to catch onto and extract the clot. While this requires extremely delicate work at the microscopic level, no incision in the scalp or opening of the skull is needed, greatly reducing the physical burden of treatment. When a woman has trouble getting pregnant, 90% of the time the cause cannot be pinpointed. Eliminating related factors boosts the possibility of successful conception. 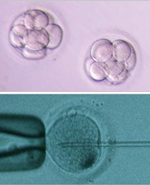 Assisted Reproductive Technology (ART), a sophisticated method for treating infertility, enables in vitro fertilization with a high degree of accuracy. In vitro fertilization definitely improves a woman’s chances of getting pregnant, but the earlier treatment is started, the higher the success rate. Our aim is to provide state-of-the-art medical care not only for infertility, but throughout pregnancy and birth as well. Until recently, the primary method for treating uterine fibroids was to make an incision, and then excise the affected area, resulting in abdominal scarring and the risk of side-effects from medication. The latest FUS technology uses magnetic resonance imaging (MRI) to monitor the lesion being treated, while energy generated by sound waves is focused on the growth or other affected area, taking just three or four minutes to cauterize the tumor with high temperatures. 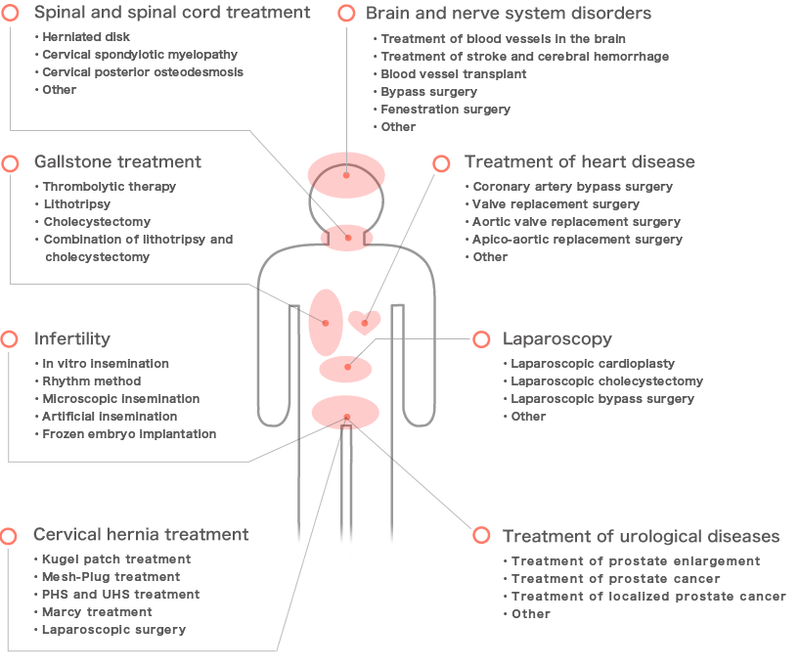 The treatment leaves no external scars, and can even be done as an outpatient procedure. A Mammotome® biopsy uses mammography (an x-ray device designed for breast examination) and ultrasound for early detection of calcification and other minor lesions. After being confirmed through images, a tube about 3mm in diameter is inserted into the affected area, and the tissue is suctioned and removed. The extracted tissue is then tested to determine whether the lesion is benign or malignant, aiding in the early detection and prevention of breast cancer. ■Your medical care will be conducted by a variety of physicians who are specialists in their fields. For our patients coming from overseas, not just any hospital will do. We want to make sure your medical care is handled by renowned physicians who are at the top of their field, and you receive the very best of care. 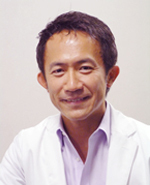 Dr. Shiga is a specialist in the non-surgical treatment of prostate enlargement. 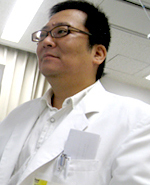 A leading member of the Japanese Urological Association, he is an expert in Holmium : YAG laser enucleation of the prostate (HoLEP), which largely eliminates recurrence and complications, and to date has treated well over 200 cases, as well as introducing "da Vinci", the endoscopic surgical assistance robot for total prostatectomies. A leader in the field of catheter-based cerebral intravascular treatment (MERCI), Dr. Morimoto is skilled at inserting a narrow catheter measuring 0.5 to 3 mm into a blood vessel and using the tightly coiled tip of the catheter to catch onto and extract a clot. This new technology has become the standard treatment for stroke, and as such is garnering strong attention. 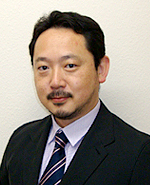 Dr. Yoshida is a specialist in cardiovascular surgery, a field that has been much in the limelight lately. With 24-hour response available for cardiovascular diseases and heart surgeries possible on an emergency basis, the number of emergency cases is rising annually. The IMS Katsushika Heart Center was approved as an emergency aortic critical care hospital by the Tokyo Metropolitan CCU in 2011. 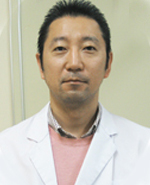 Dr. Kurosaki became an expert in thoracic endoscopic surgery in France, and currently has a thriving medical practice at the Laparoscopic Surgery Center in the Itabashi Chuo Medical Center. Radiation therapy is used in conjunction with surgery and chemotherapy and plays an important role in treating cancer, suppressing the further advance of the cancer, and alleviating pain and other symptoms when it is used safely and effectively. One feature of this treatment is that, unlike surgery, it does not involve the removal of any organs. In recent years, it has become possible to focus a large amount of radiation on the cancerous tissue, minimizing irradiation of the surrounding normal tissue. This increases the possibility of treating the cancer, and at the same time minimizes side effects. With this method, fixed radiation treatment is possible; a single lesion is tracked, and correction is carried out as the treatment progresses (the first site in Tokyo to offer this treatment, and the fourth in Japan). With this method, the radiation beam can be precisely directed at the cancer cells, pinpointing the exact cells to be irradiated. A robotic arm at the tip of the device can irradiate in various directions. The offset between the robotic arm and the target point (cancer cells) is around 0.2 mm on average, and the treatment is non-invasive. A device installed on the ceiling compares photographic images of the patient and information about the treatment plan, and the lesion site is tracked, with correction being implemented as needed. Treatment takes 30 minutes to 1 hour, and only a few treatments are required. This is a high-precision device that is mainly used to treat lung and brain cancer. Linac (Full option) Trilogy manufactured by VARIAN Co.
Trilogy enables treatment of lesions in a broad variety of sites, and accommodates IMRT (intensity-modulated radiation therapy). This is a machine that performs external radiation therapy by irradiating the cancer site from outside the body, passing the laser beam through the skin, in order to completely eradicate the cancer itself and cancerous cells in the surrounding area. It generates the high-energy x-rays and electron beam necessary in order to treat the cancer. 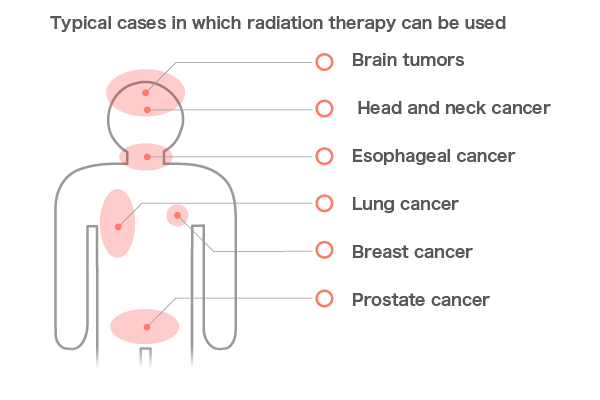 The intensity and shape of the radiation beam and the direction of radiation are changed at the clinic, allowing the device to be used in a comparatively broad range of cancer sites. The device is capable of using 3D-CRT, or three-dimensional conformal radiation therapy, and IMRT, or intensity-modulated radiation therapy, which are special external radiation methods, in order to minimize the effects of radiation on healthy tissue around the affected site. A particle beam is a flow of high-energy particles, it is a type of radiation. Most radiation therapy use X-ray beams which penetrates deep into the body. The dosage is highest just below the surface of the body and it gradually decreases with depth. Therefore to perform this type of radiotherapy, the maximum dosage is normally necesary. However, this means that also healthy tissues gets damaged. Besides that, if the tumour grows rapidly, the radiation therapy has a little effect. On the other hand, Particle beam therapy accelerates to approximately 70% of light speed and the irradiates the cancer lesion, this way it can treat cancer that is deep-seated within the body. Two types of particle beam therapy are the heavy ion therapy and the proton therapy, both are able to precisely localize the radiation dose and typically have little side-effect. During the irradiation the patient does not feel pain or heat. The heavy ion therapy is twice or three times more effective than proton therapy and the irradiation time is shorter. Both therapies are promising treatments for high risk patients that cannot undergo surgery and for elderly people. Usually patients can return society shortly after this procedure. However, it cannot be applied to all types of cancers, the patient should be examined in order to determine whether the therapy is possible or not. The three major cancer treatments are surgery, radiotherapy and chemotherapy. And recentlly Immunotherapy and Gene therapy ,which are one of the new adoptive iimunotherapies, are expected synergistic effect combined with the three major cancer treatments. It is clear that cancer patients' immune cells are less-active than those of healthy people. Therefore, this method activates the lymphocytes and other immune cells. This way the immune system of the body improves and it can attack the cancer cell in order to prevent the cancer from worsening. The cells that are capable of killing or damaging transduced into your body and antibody for the cancer cell, it is called Gene immunotherapy. It uses materials made by the body or in a laboratory, it is best to use the patient's cells because the side effect will be fewer. Moreover, Gene therapy is a treatment which normalizes the irregular gene and strikes cancer cells only in order to stimulate the cancer cells to annihilate. Cancer and other diseases occur because the function of certain body cells decrease and these abnormal cells become cancer cells. For this treatment the patient is on an IV drip that makes the cells recover their normal functions. Gene therapy does not cause any pain. The patients do not suffer from side effects and can continue their daily activities while under treatment. These new treatment are possible to go for the treatment at any time and you can continue your daily activities. It is applied to patients of almost every type of cancer (excluding some blood cancers, including leukaemia and T-cell malignant lymphoma). Stem cells are undifferentiated biological cells that can divide into specialized cells and produce more stem cells. Stem therapy uses this manner of growth and aims to replace cells that are damaged or destroyed by the disease, with healthy functioning ones. This is an effective therapy for COPD, Parkinson's disease, ALS, Alzheimer, dementia, cardiovascular disease, liver disease, kidney disease, connective tissue disease and Crohn's disease, it can be an anti-aging treatment and an adjuvant therapy for cancers.